Four Seasons Chimney Services was started by Gerry & Laura Shedin. 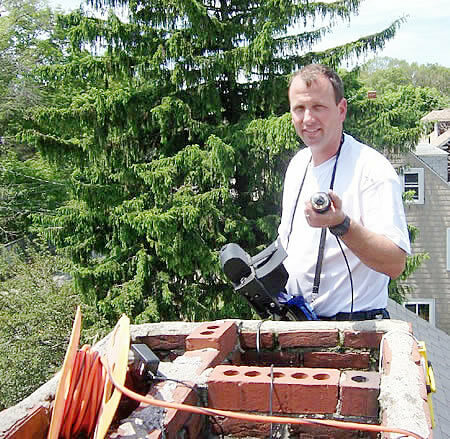 Since 1985 Four Seasons Chimney Service has been servicing chimneys in the greater Boston area; and thus, we realize that ‘word of mouth’ is our best form of advertisement. When you call Four Seasons Chimney Service, you will be speaking with someone who cares how you view our service. Proud to be family owned and operated, Four Seasons Chimney Service has a team of dedicated, long term employees that are certified to handle any situation! We are enthusiastically proud to have been chosen by several Boston Fire Department Engine Companies to service their chimneys. To see some of what we did, click on the links to the left for the Engine companies. When you need to speak with someone who is concerned with helping you solve your chimney venting problem, give us a call. Our full-time Office Manager has a full-time interest in helping you. You can rest assured when you engage our company that we have done all that we can to make your experience with Four Seasons Chimney Service an enjoyable one. Our company is fully insured with Liability Insurance and Workers Compensation Insurance. Did you know that when an unsuspecting homeowner invites a service company into the home to do work, that the HOMEOWNER may be responsible for injury to a workman if the company does not have Workers Compensation Insurance?